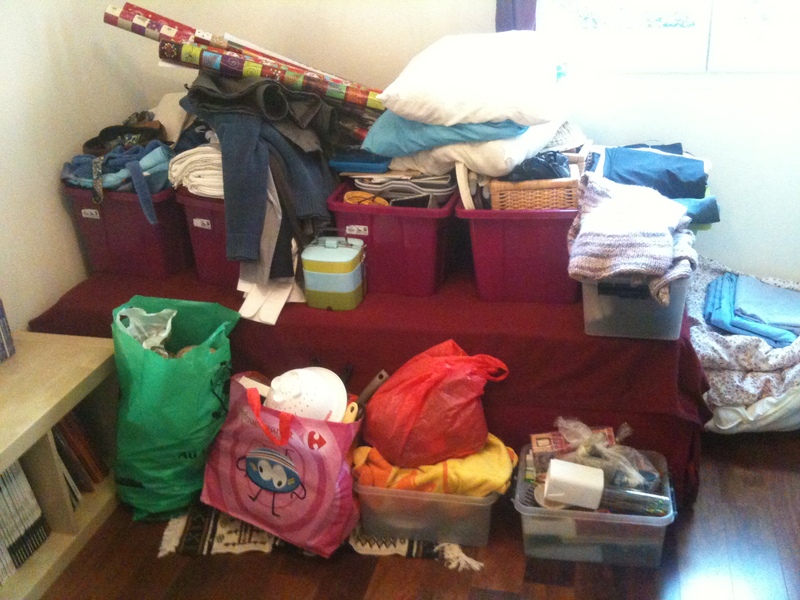 Today I finished rummaging through all of my stuff and classify between “to keep” and “to sell”. I had started that process a couple weeks ago, but was not quite finished. I’m happy I found the courage to do it today and process clothes, cooking & dining equipment in these categories. There was a real lot of stuff. Probably the equivalent to ten standard moving boxes. Its this huge pile on top of the bed, and in front of it. It’s not easy parting with stuff like that. Most of it is actually useful, or *could* be useful, at some point, someday… So it’s really the same process as for the packing list I’m working on. If I go through the list with an eye of “will I need that ?”, I’m keeping most of everything. This time what I did was “did I ever use that ?”. That was the end of the line for more than half of cutleries, plates, cooking equipment, towels, and all of the drapes :p Regarding clothes, I also suppressed anything I havent worn over the last year, and then some. I’ll buy some new ones when I come back – I’m certainly not giving enough of a profit to the clothing stores anyway ! So, all of this will be put on sale next saturday, in a local fire sale where people try to either empty their attic or make a profit from it. I’ll clearly be in the first category. I’ll sell everything at 1 or 2€, or even give away a large part of it. It’s really impressive how much we can buy, store away, and never use at any point.